Perhaps one of the most misunderstood issues within the church is the issue of depression. Many don’t know how to deal with it…not Christians struggling with it, or Christians trying to help the struggling. Depression is one of the few areas of mental health that is actively prevalent within the Church since most who struggle with it have jobs, families, and responsibilities just like everyday people. Before I get into this any further, I think going through what depression is would be advantageous to people who likely have a misconception of it. Depression is defined as, “…sad, empty, or hopeless feelings; slowed physical and cognitive disorientation; changes in weight, appetite, and sleeping patterns; diminished interest or pleasure in activities and time spent with friends; and occasional to frequent thoughts of death and suicide.” (Lastoria, 1999, pp. 336) It is considered a “mood disorder” within the same class of mental illness as bipolar disorder and is sometimes called unipolar depression. Depression is a physical and psychological disorder that can be diagnosed and treated with varying forms of therapy, or medication or in many cases both. Here is where things get a little hairy for Christians…did you see that word “medication?” Yeah…it’s a word that appears and at its appearance, you have a wide divergence of opinions. Some are against taking it, others think its ok in every circumstance, and others take a more balanced approach. There is an element of depression though that is often overlooked and that is the spiritual element. Many times depression can be set on by disobedience, or it can just be an attack from the enemy (he’s kind of a jerk like that). In every instance of depression, spirituality plays a role, which is one of the reasons that many Christians find it difficult to tell people about it. Only those willing to be ostracized and gossiped about reveal that they struggle with depression. Much of this is because many Christians are…well I don’t have a kinder way of putting it so I’m just going to say it…ignorant that depression is an actual mental illness. Why do I say this? Well, most people equate depression with “bad thinking,” and while sometimes this is the case, more often than not, it is due to other factors that require actual assistance or the depression could worsen. It is a mental illness that necessitates community, accountability, and most of all…love. It never goes away fully…there is always a residue even on the good days. For me personally the gospel holds hope and power over this…I know that it is already defeated…I know that it has no power over me…and I know what is in store for the future. All of these things grant me hope that when all things end; despair and depression will end as well and there will be nothing but joy and contentment…but until that day I must choose to do battle every single day.With all of this being said there is a stigma to depression…especially to those who take medication for it. I am one such person (which many people find surprising). Due to a chemical imbalance in my brain and an inability for my body to consistently produce enough vitamin D, I am on vitamin supplements and on not one but two antidepressants. Many view these medications as drugging away the problem. In some instances, this is true. A person with a psychological or spiritual cause definitely do themselves a disservice by taking it…but what about those like me who have a physiological imbalance? Should I be doomed to wallow in a pit that I literally cannot do anything about out of some backwards conviction that I just need to “buck up” and “deal” with it? In honesty, that thought process is every bit as asinine as telling a cancer patient they should not receive chemotherapy because they just need to pray that God will heal it (I have actually heard this as “counsel” from pastors and church leaders to those dealing with depression). No two people are the same…and every case of depression is unique. Pat answers don’t work and in most cases only make things worse. So if you have nothing better than a pat answer, do the person a favor and be quiet. Just be there for them in that moment as best you can. Let me give another example of what I mean from my own life. My wife is a woman who can tell when I am…off. Now this being said just this last Friday I had a hard day (and that is putting it mildly). The day started fine…but as it went on, I got more irritable…more moody…and eventually by three in the afternoon, I was just staring at my computer screen at work. I was immobilized as if being held down and told the most terrible things about myself. I was convinced in that moment (and I remember this vividly) and actually believing that my wife and our closest friends hated me and that I was worthless and terrible at everything I did. When my wife got home, she found me in my car in the garage weeping uncontrollably. It has been quite some time since I have had an episode like that and let me tell you (if you don’t know already) it sucked. It came out of nowhere and caught me completely off guard…this my friends is what it looks like when you are being attacked by the enemy. In those moments I texted those same friends I thought in that moment hated me and asked for their prayers. By the time evening came by, the feelings were gone and I was myself again. Understand that Satan knows our weak points…he knows where to strike to cause the most damage and he takes advantage of that knowledge when we are at our most vulnerable. He is relentless and merciless in his pursuit because of his hatred of us and his hatred of God. He will have lies told to you about people important to you…like I did. The benefit to me was that even though I felt one way I knew that my wife and my friends loved me and cherished their relationships with me. Now imagine for a moment…if I had not been on medication to correct the chemicals in my brain as they should be, it would have been a lot worse. When pastors and other Christians tell people dealing with depression that antidepressants are a “crutch,” they play into the enemy’s hands and unknowingly leave their flock exposed to predators. If you still believe that antidepressants are a crutch after reading this than stop taking whatever medicine is helping you through the day (whether it be something as simple as an allergy pill or as serious as blood thinners for a clot) and just “believe” yourself better (yeah didn’t think so). God has given us the advancements that he has to help ease our suffering and so that we could help our fellow man…don’t beat on people who need treatment for an illness they cannot help…to do so is cruel, inhumane, and worst of all sinful. To those struggling with depression but fearful of telling others because they are embarrassed or don’t want to face the ridicule all I can say is this. Get help. Depression is no joke and is one of the top 10 killers in this country (that being death by suicide). Talk to a pastor, a church leader, a family member, a best friend…anyone you trust about what you are going through and then seek help. If you have a chemical imbalance like me than don’t be afraid to take medication or supplements to correct the problem, but understand that medicine doesn’t eliminate depression it merely makes it easier to handle. All depression has a spiritual and psychological element to it, so in taking away the physiological imbalance you make it easier to deal with the other two. Support from people who love you and encourage you is vital to controlling the symptoms of depression, allowing you to live a healthy and full life. Yes, life will still be hard and yes, you will still have moments where you’re going to break (like I did Friday) but having a plan, coping strategies, and support help tremendously in managing it. Do not do it alone…this is what we have each other for. This is a reason that God made sure that His people were a people…a true community that can help one another through the hard times. Take advantage of that and know that you are not alone. 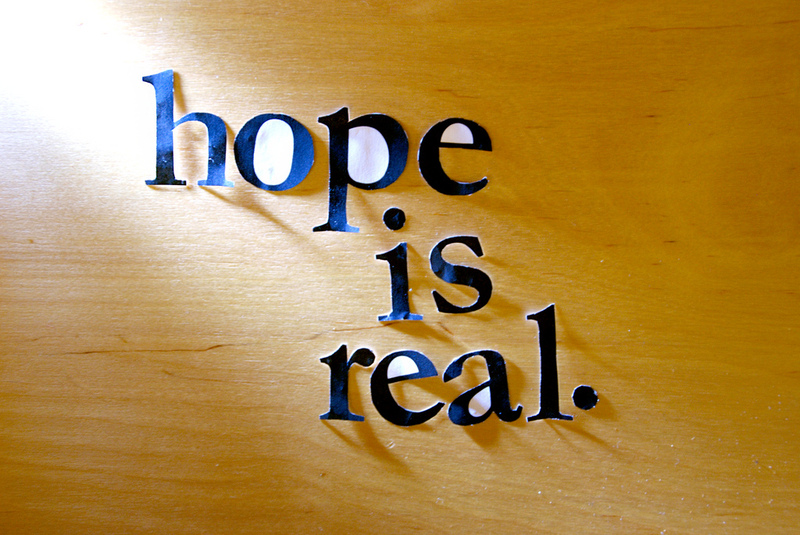 And last but certainly not least, I want to tell you that hope is real and His name is Jesus. He is there in the midst of the pain…in the midst of the confusion…we just have to stop and listen for His voice. Peace and Blessings and again thank you for reading. Lastoria, M.D. (1999). Depression. In Baker Encyclopedia of Psychology and Counseling (pp.335-341). Grand Rapids, MI: Baker Academic. Thank you for your balanced view of this; I am a Christ-follower who has suffered from acute medically-diagnosed depression several times in my life. While, yes, there is definitely a spiritual component to it, it is not always wholly spiritual and well-meaning people in the Church have told me that I needed to “pray it away” and not seek medical treatment (I like that cancer analogy there — I can relate). The main pastor at my church has bashed the use of medication since it can be abused to numb pain that may be there for a purpose in some instances, and, after speaking with him at length, he corrected himself to say that if it is a physical problem, treat it physically and if it is a spiritual problem, treat it spiritually. There is a balance and a difference. Depression is a disease that is incredibly misunderstood because, sadly, only those who have suffered from it can understand it. Everyone has experienced sadness in some form or fashion, but one cannot fathom the inability to hope or to see or to believe that there is any chance for happiness again unless one has been in that state for an extended period of time. Just the other day, a friend said he was “depressed” after his sports team lost and I cringed. I angrily asked if his “symptoms” had lasted for more than three weeks then politely correct him: since they have not, depression is not the correct term for their feelings. I do this often. It’s being a killjoy but it’s restoring dignity and distinction to the word. All that to say, thank you for fighting the ignorance, Justin. Thank you for the kind words and encouragement Line. You are so right in saying that those who have not suffered with the disease lack an understanding of it. One of the reasons I write on my depression is to show that even someone with my theological credentials and education still struggles with it. If a theologian can suffer with it…so can anyone else…and it is not something to be ashamed of. The church needs to learn this and welcome broken people with open arms. Is it possible to be healed of depression…I believe it is. In fact one of my best friends was depressed to the point of attempting suicide several times and now they are happily married and living a full life. So deliverance is possible…but I have learned that while awaiting deliverance it is necessary to do battle everyday in obedience to the cross. Some days are easier than others, but i thank God that I have family, friends and a church family that are supportive and prayerful. What’s surprising is that after writing this I am actually beginning the process of moving off of antidepressants for a more holistic approach to boosting serotonin and dopamine production. It’s a slow process but I’ve been on the medicine for 2 years and figured it was time to move off of it to a more permanent solution. I will be sure to add you to my prayers as you battle this disease as well, and pray that the Lord grant both of our prayers that he remove this “thorn” from our flesh. Shalom.